Home » 12-13 Offseason » Would You Trade R.A. Dickey to the Red Sox? Would You Trade R.A. Dickey to the Red Sox? In today’s edition of “Would you …?” we discuss the fantasy of trading R.A. Dickey to the Boston Red Sox. As you know, the Mets could use a catcher — preferably one that can catch, throw, and hit a bit. Ideally, such a backstop would also be on the young side. If you haven’t heard of Lavarnway, here are the basic details: 6’4, 225 lbs., 25 years old, righthanded hitter who hit 32 homeruns with a .390 OBP and 1.002 OPS in the minors in 2011. That wasn’t necessarily a surprise — he led all D-1 hitters in batting and slugging as a college sophomore and set the Ivy League record for career homeruns. Lavarnway is a graduate of Yale, so he might be relatively intelligent. All scouting reports on him boast about his hard work ethic and discipline. Sounds good, right? Would you be willing to trade R.A. Dickey for someone who appears to be the next Johnny Bench — if the Red Sox would be willing to part with him? Not so fast. There’s always a rub, right? As great as Lavarnway sounds, there’s a catch (pardon the pun). Actually, um, it’s that Lavarnway isn’t much of a catcher — he’s more like a slugger who happens to squat behind the plate. Think Mike Piazza. Now, if Lavarnway can hit like Piazza, that might not be so bad. But if he doesn’t, then he absolutely, positively, cannot be behind the plate. He has a weak arm, poor agility, and slow feet. He turned himself into a barely acceptable catcher via sheer hard work; he’s one of those guys who gets every last drop out of his athleticism. Hmm … come to think of it, Lavarnway sounds a heckuva lot like Mets current catcher Josh Thole — but with offensive potential. Now this discussion becomes a game of “would you rather …” — in which case, I’d rather have someone who catches like Josh Thole but might hit like Mike Piazza than have someone who catches like Josh Thole and hits like Josh Thole. But, I wouldn’t trade R.A. Dickey for that mystery. I MIGHT trade Dickey for a package that includes Lavarnway and a few other players — Jacoby Ellsbury? Daniel Bard? Jarrod Saltalamacchia? Now that would be interesting; the Mets sending Dickey, and, say, Thole up to Boston for two catchers (and perhaps another prospect or two). Considering that the Bosox just signed veteran David Ross to a two-year deal, and have a hotshot game-caller named Blake Swihart in high-A ball (as well as another highly touted catching prospect in AA), they might be open to dealing both backstops in return for knuckleballing 20-game winner and his personal catcher. Personally, I’d need another player or two to sweeten the offer — and it would have to be someone along the lines of an Ellsbury, Bard, or one of their top-5 prospects. According to Baseball America, the Red Sox #1 prospect is Xander Boegarts, a toolsy 21-year-old shortstop from Aruba whose athleticism and raw talent is drawing comparisons to Hanley Ramirez. Maybe the Sox would “throw in” Boegarts if the Mets included, say, Ruben Tejada — who would provide immediate insurance in the event defensive whiz Jose Iglesias doesn’t pan out at the plate. Remember, this is all fantasy, so we can dream up whatever we want — what are you thinking? Might the Mets do such a deal? Should they? Would you? What about the Red Sox? What about the players mentioned above? Would you add / subtract any names? Start dreaming in the comments. R.A. Dickey to Boston for Lavarnway would be a good start. I’d think along the lines of some bullpen help, too. They had a pair of 26 year olds with gaudy relief numbers. That doesn’t solve the OF dilemma, but getting a player like that to suit up at minimum wage for the next several years would certainly take the sting out of losing Dickey. Remember, whomever gets Dickey is ONLY guaranteed one year so you’re not necessarily bringing back a king’s ransom. Should they? No. Would you? No. Can’t take on another non-athletic player…have too many already. Will take Salty but not for Dickey or Niese. Salty plus elisbury for Dickey is intriguing, but both can be FAs for 2013 so that is risky as well. First off, Mr. Moron, there’s no need to shout – I can hear you clearly when mixing in lower-case letters. Second, I stated quite clearly that this was a fantasy. Third, I don’t take orders from you. This is my blog. Don’t like what I write? Change the channel. Fourth, this comments section is for conversation amongst Mets fans. Conversation entails engagement, interaction, and sharing. Sharing is not shouting. If you have an idea to share, please do so and we’ll all discuss. Is your post a fantasy Joe? After the Marlins moved their team to Toronto in one sweeping move, nothing is out of the realm of possibility. if we trade RA we need to get at a min of 2 returning players that will automatically help the team and start. not sure i want a potential guy in return. convo with bos should start with ellsbury. To make up ground on the competition, we probably need some gambles to go right. Since standing pat will leave us forever behind the 8-ball, taking risks on high-upside guys is probably the right move. Whether Boegarts, Ellsbury, Bard, Salty and/or Lavarnway are the right high-upside guys, I don’t know. They’d certainly upgrade the physical talent on our roster, but I’m concerned about their track records. Ellsbury’s been mediocre at times, and injured at other times. Bard was an elite set-up guy based largely on velocity that may have taken a step back. Salty + Lavarnway would likely give us one of the best offensive catching duos in the game. Just one of them, though, and I’d have some doubts. Is either that elite for a #1 catcher? Salty is K-prone and it’s not clear whether he’s still improving or whether 2012 was a career year. Lavarnway has the defensive limitations Joe mentioned, and he ain’t Piazza yet. I do like the idea of including Tejada in a trade for a higher-upside SS. Ruben is good enough that a good team could really use him, but not good enough to turn a bad team like the Mets into a contender. Searching for the next Reyes/Hanley is probably a better approach. The more I think about the future of the Mets the more I think we have to trade Dickey, I would much rather trade Dickey then one of our young starters. I would get the Red Sox and the Yankees involved, both can use them. The Mets also have to sign David Wright, I dont understand what is taking so long. That signing holds up everything. money is the hold up! Ok if we are going to do this then here is what I think is a tough but fair trade request: RA Dickey, Daniel Murphy, Lucas Duda for Lavarnway, Dustin Pedroia and Clay Bucholz and one of their SS prospects. Red Sox get a Cy Young pitcher who is a leader and a good 2B for their ballpark and a 1B that is perfect for their ballpark. The Mets get a RH catcher, a bonafide 2B who is a leader and decent backend rotation pitcher and SS prospect. Are you sure you dont want to dangle Murphy and Duda in front of the nationals for Harper and Strousburg before we pull the triger with the SoX. I don’t really get why Boston would be interested in RA if they’re going through a rebuilding phase. Wouldn’t RA be more attractive to a team that thinks it’s ready to win now, if only they had one more stud starter? The Dodgers have taken some absurd risks of late, maybe the Mets could dupe them into something? Maybe, the Red Sox miss having a knuckleballer on their staff. I don’t believe the Red Sox are in a long-term rebuilding phase; I think the plan is to rebuild to win right now. Otherwise why do they sign David Ortiz and David Ross? It doesn’t matter what the Mets have now, because the current team has no chance at a postseason bid. It’s all about the future, starting in 2015. If the Mets trade Dickey, they need to get at least 3 of the following : a young catcher, a righthanded hitting outfielder with power, a speedy centerfielder and a potential closer or young starter. First, determine what teams want Dickey and then deal with the package coming back. I can’t be sure but I’d bet that the Red Sox would gladly give up Lavarnway for Dickey, it’s the other 2 players they might not want to part with. RA to the Sox for Brentz Barnes and Salty…Salty and Niese to the Jays for Dárnaud and DJ Davis, Murphy Gee and Duda to the D´backs for Upton…done as done. I’m a Sox fan so please accept my apologies for the intrusion to your space, but I thought I would offer our perspective, or at least mine. The Sox would likely hae interest in Dickey. Who wouldn’t want a Cy Young Award winner? But here’s where it gets sticky; the Sox know knuckleballers and they know each one requires two roster spots. We tried David Ross with Wakefield a few years back and it was a disaster. I think Ross would demand his contract be torn up rather than experience the pain from that short time in Boston. So that means another catcher and Thule’s name was mentioned. With the roster flexibility they hae at this time, I can’t see them locking themselves into a Lavarnway / Ross / Thule arrangement. But again, there is another piece that requires consideration. The Sox are said to be in hard on Napoli. Should they sign him, it would be primarily for first base, but he clearly could catch as needed. So the Sox seem to be setting up a Laarnway / Ross / Napoli trifecta anyway. Taking all this a step further. Could the Red Sox possibly consider trading both their present catchers? If that were a consideration, then I could easily see them setting up a Ross / Thule / Napoli rotation at the catcher position, that is what would be required to obtain RA. 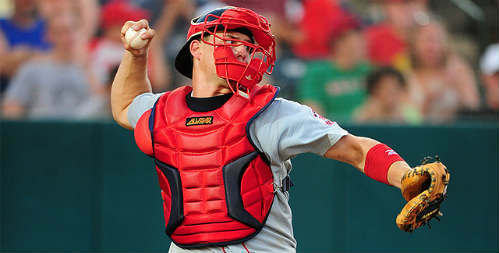 If Lavarnway is in their long term plans, I can’t see room for 3 catchers, especially when they have openly stated Ross is being seen as a 1A type catcher as opposed to strictly a backup. Could it happen? Sure it could. Will it happen? That’s less clear. Could the Mets be a destination for one of Boston’s catchers? Sure, they could use RA, they could use Ike Davis, and they also hae a surplus of lefty relievers that may interest the Mets. I see Doubront moing to long relief / 6th starter role as one lefty, then Morales is a lock, that leaves Hill, Breslow and Miller as two too many. Throw Aceves into the mix as another aailable bullpen / starter arm. There’s lots of pieces that can be discussed. No apology necessary – we greatly appreciate your joining the conversation and offering your opinion! What is the word on Lavarnway from the Boston local perspective? Do people think he can be a catcher? Or is his long-term job at 1B? Are people high enough on Lavarnway’s bat that you might not miss A-Gone?